Chuck tender steaks are infused with a Cuban style marinade and grilled, sliced, and placed on top of a Cuban inspired corn and black bean salad. 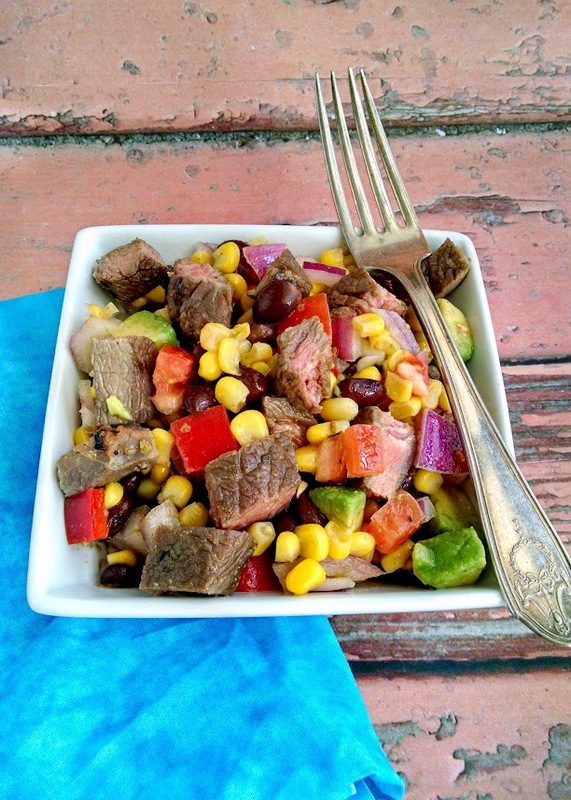 This Cuban Style Steak and Corn Salad sounds expensive, but really isn’t. I’ve been on a Cuban kick for some reason. Maybe I’m getting a little tired of the typical southwest or Tex-Mex flavor. Cuban style food has a lovely citrus undertone to it and TONS of garlic. It’s oh so tasty! Now, these recipes are posted backwards. I made the pork after this steak. I’m not sure why I haven’t posted this recipe yet, but I am now. And I glad I am. This marinade and salad is delicious. I truly love citrus flavors in the steak and in the dressing. It really does tie the two together making for an amazing and healthy dinner. Here’s how this recipe came about. I’ve been perusing the markdown meats section lately. I mean, who can turn down some deliciously thick pork chops for $3? Or some Milanese style beef for $8? That package actually makes two meals for us. And don’t get me started on ground beef and steak. Like the chuck tender and flat iron steaks I commonly find in the grocery marked down for quick sale. There’s nothing wrong with marked down meat. In fact, I’ve purchased the meat and have forgotten until 2 almost 3 days later before I have shrink wrapped them for freezing. We have yet to get sick from any marked down meat. Ever. I’ve been eating it since I was a kid. Of course, that’s when no one knew what flank steak and chuck roast was. Now, it’s a new generation of marked down meat. Chuck tender, flat iron, Milanese, arracheria; these are all new terms for beef cuts to me. That doesn’t mean I’m going to shy away from them because I don’t know what they are. That just means that I’m going to do some research and find out the best ways to cook these cuts of cheap meat. No. Cheap does not mean tough, inedible, or that it’s going to taste funny, be stringy, or just turn out like shoe leather. It just means that the trend for this cut hasn’t quite hit the mainstream market. And it may never hit the mainstream market. All the better for me! And now for you, because if you keep reading AKHA, I’ll walk you through several different ways to prepare more frugal cuts of beef. And who doesn’t want to save some money and some less expensive beef and marked down beef at that! Like these chuck tender steaks: I purchased this package for around $7 or so. There were four steaks in the package. That means two meals for us. Two meals of tasty steaks for $3.50 a meal or less than $2 a steak. You can’t help but save money with this meal. Chuck tender steaks should be braised or marinated before grilling, broiling, or pan-searing. I, personally, like the marinade method. It allows me to flash fry, pan sear, or quickly grill this delicious cut of meat. Not to mention marinades come in many different shapes, sizes, and flavors! There’s as many flavors of marinade as there are countries on this planet, and then some. But for these steaks, I wanted to travel to Cuba. The flavors in this Cuban style marinade taste amazing! The citrus base really does help tenderize meat and infuses delicious flavor into this already delicious cut of meat. It also helps to bring the citrus flavor to the salad dressing. It ties all the Cuban style flavors together. Which taste amazing!! The citrus, oregano, cumin, and garlic combination sound so simple but is seriously and flavor spring break in your mouth with the steak bring super delicious and the salad being the perfectly light and crisp base to bring it all together. What’s your favorite cheap cut of meat? 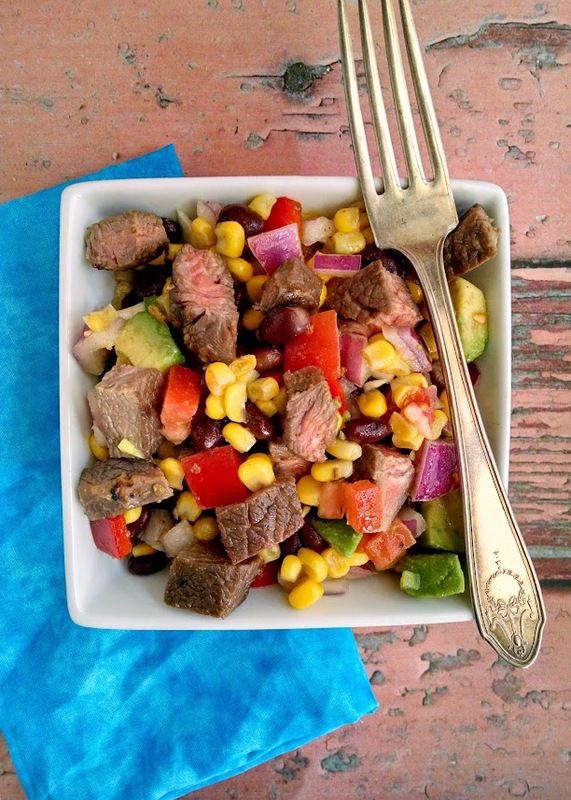 Chuck tender steaks are infused with a Cuban style marinade and grilled, sliced, and placed on top of a Cuban inspired corn and black bean salad. 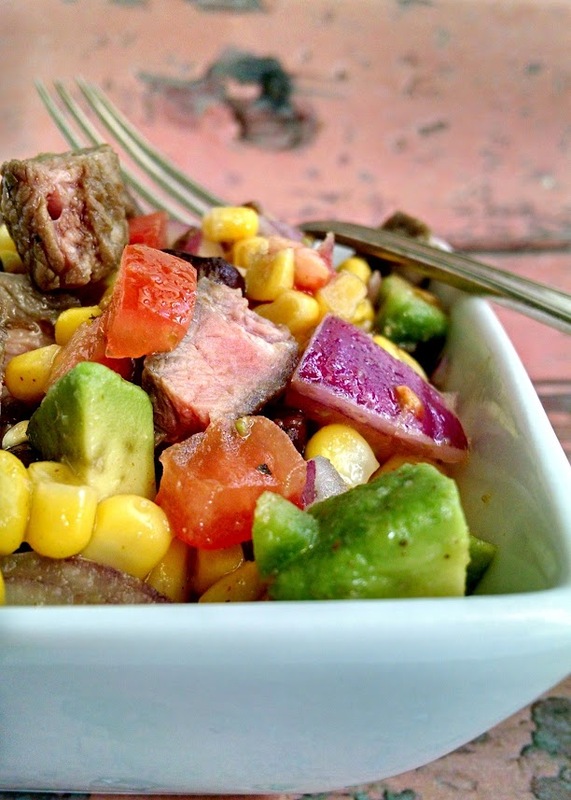 This Cuban Style Steak and Corn Salad sounds expensive, but really isn't. Place first 8 ingredients (steaks through ground cumin) in a zip top plastic bag and marinate at least 30 minutes or overnight. Combine the next 6 ingredients (black beans through avocado) in a large mixing bowl. Set aside. Whisk the remaining 9 ingredients (orange juice through oregano) in a small mixing bowl until the honey is dissolved. Prep your grill for high heat. (We have a gas grill. If you have a charcoal grill, make sure you have enough coals for high heat. Grill the steaks 2 to 3 minutes per side or until medium rare. Remove from heat, cover with foil, and allow to rest. Divide the salad mix even between 4 plates and top each with one fourth of the meat. serve with some chips and salsa. I love cuban food but I don't really know how to cook it, I gotta try this it looks amazing! I wonder if it would work with chicken or pork, I like steak every now and then but the rest are not big red meat fans! We used to do that in France when we could find it. We never got sick either – and sometimes it was the best way for us to enjoy a little meat! We also did a lot of salads, pastas, and stir-fries so we could use less protein to feed the whole family. I love the flavors you've got going on in this salad and I can't wait to try it! Looks super yummy! I can't wait to add it to our menu! I typically try and buy marked down meat too!